This article is the third in a multi-part series on microservices (micro-services) anti-patterns. 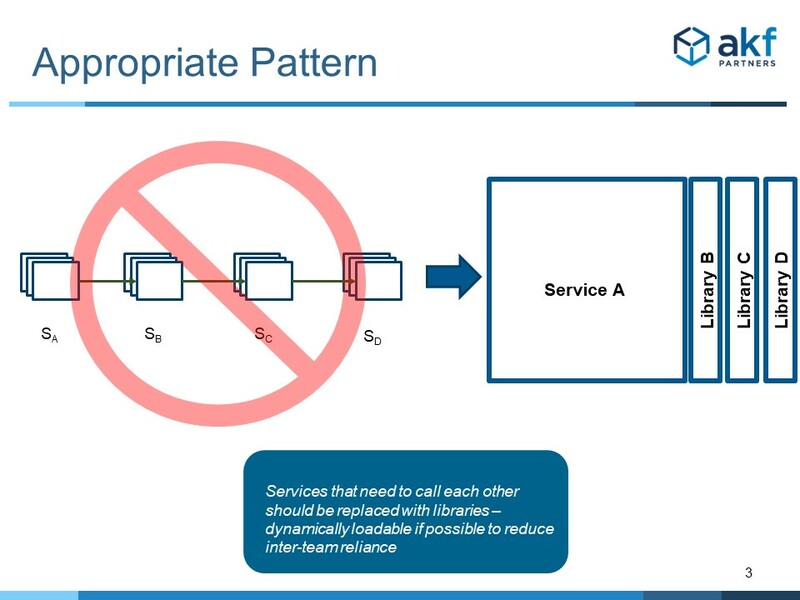 The introduction of the first article, Service Calls In Series, covers the benefits of splitting services, many of the mistakes or failure points teams create in services splits and the first anti pattern. 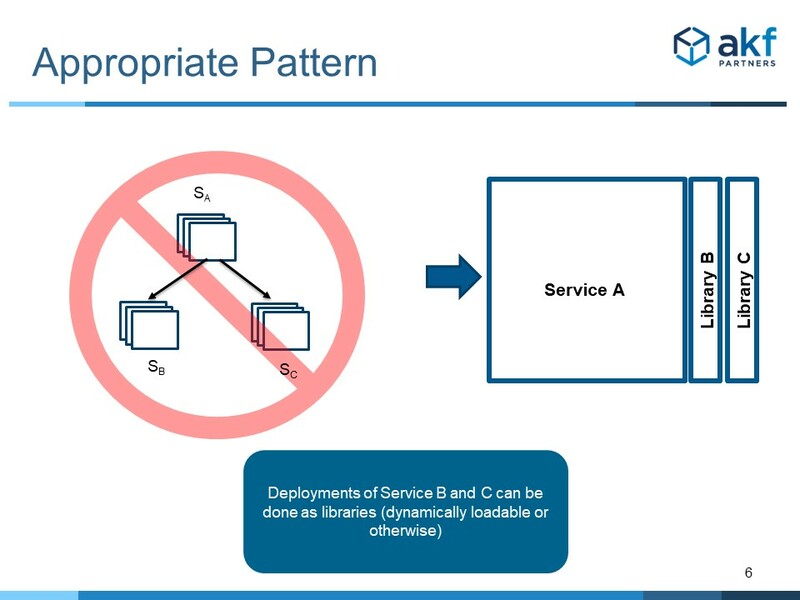 The second article, Service Fan Out discusses the anti-pattern of a single service acting as a proxy or aggregator of mulitple services. 2) A failure or slowness in either database, even if accessed in parallel, will result in a very slow or unavailable service. Persistence engine means anything that stores data as in the case of a relational database, a NoSQL database, a persistent off-system cache, etc. 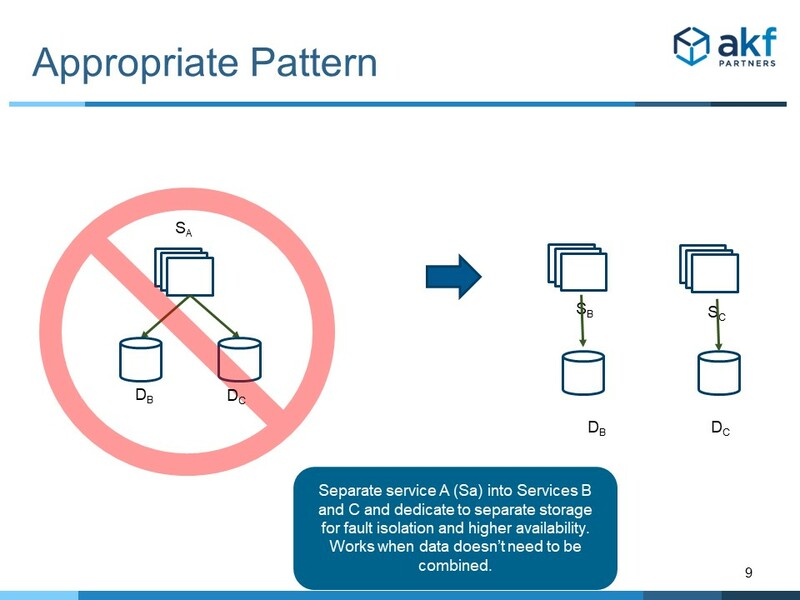 Anytime a service relies on more than one persistence engine to perform a task, it is subject to lower availability and a response time equivalent to the slower of the N data stores to which it is connected. 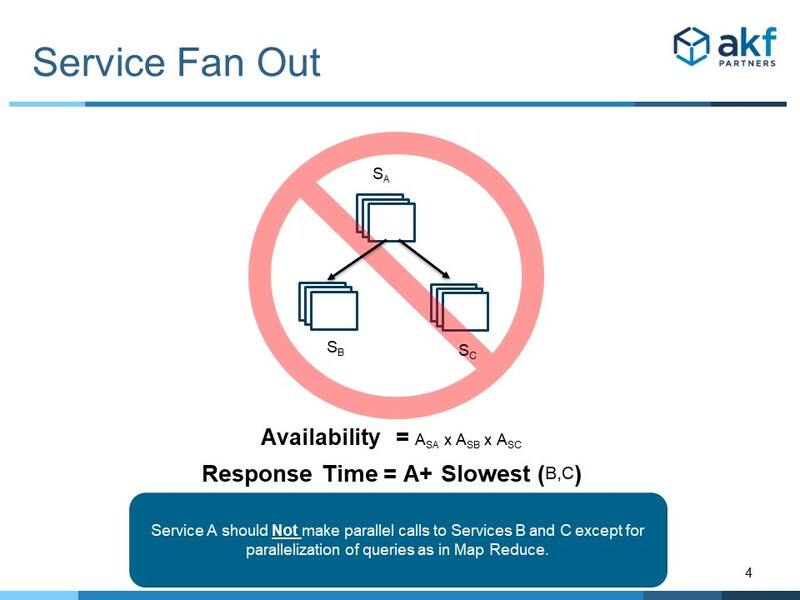 Like the Service Fan Out anti-pattern, the availability of the resulting service (“Service A”) is the product of the availability of the service and its constituent infrastructure multiplied by the availability of each N data store to which it is connected. Further, the response of the services may be tied to the slowest of the runtime of Service A added to the slowest of the connected solutions. If any of the N databases become slow enough, Service A may not respond at all. 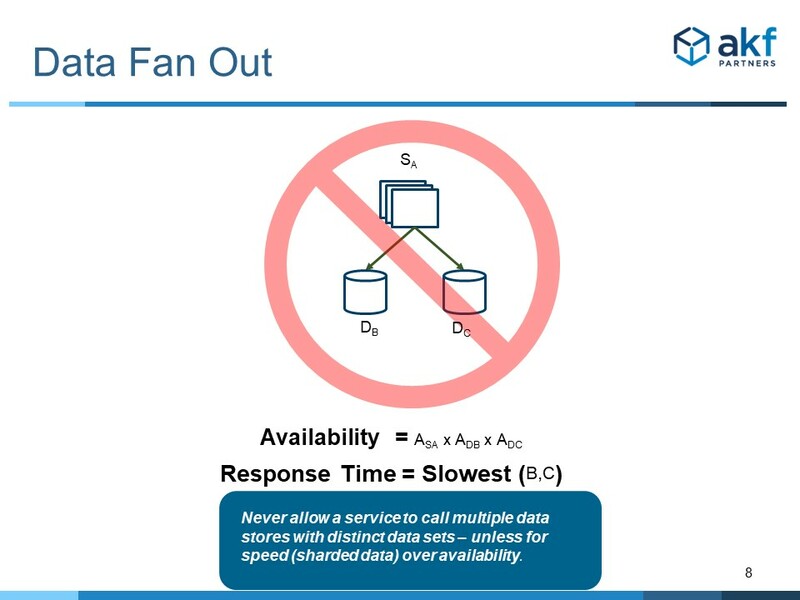 Because overall availability is negatively impacted, we consider Data Fan Out to be a microservice anti-pattern. One clear exception to the Data Fan Out anti-pattern is the highly parallelized querying done of multiple shards for the purpose of getting near linear response times out of large data sets (similar to one component of the MapReduce algorithm). In a highly parallelized case such as this, we propose that each of the connections have a time-out set to disregard results from slowly responding data sets. For this to work, the result set must be impervious to missing data. As an example of an impervious result set, having most shards return for any internet search query is “good enough”. A search for “plumber near me” returns 19/20ths of the “complete data”, where one shard out of 20 is either unavailable or very slow. But having some transactions not present in an account query of transactions for a checking account may be a problem and therefore is not an example of a resilient data set. Our preferred approach to resolve the Data Fan Out anti-pattern is to dedicate services to each unique data set. This is possible whenever the two data sets do not need to be merged and when the service is performing two separate and otherwise isolatable functions (e.g. 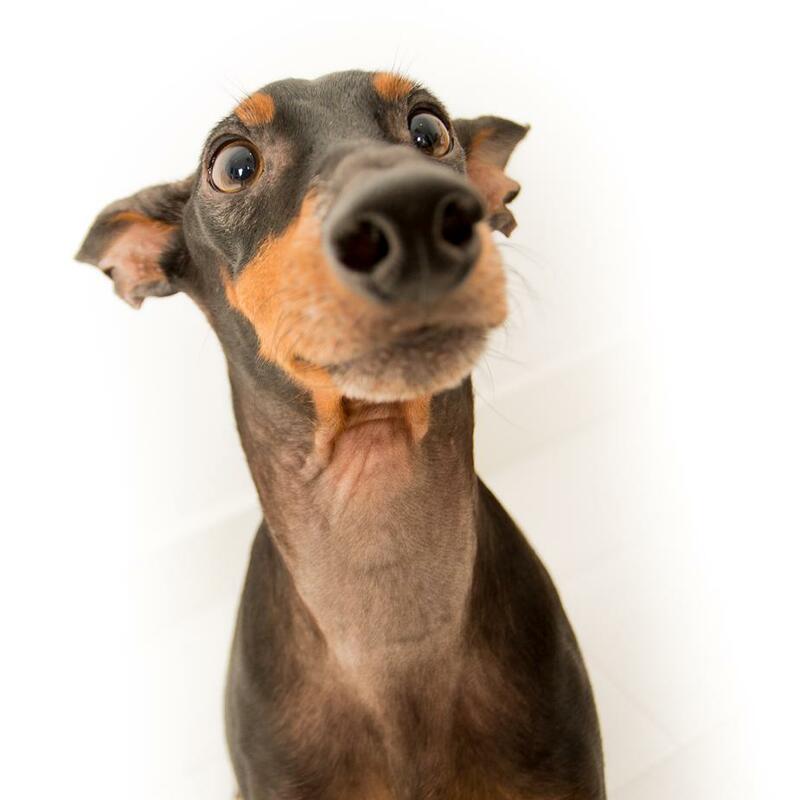 “Customer_Lookup” and “Catalog_Lookup”). When data sets are split for scale reasons, as is the case with data sets that have both an incredibly high volume of requests and a large amount of data, one can attempt to merge the queried data sets in the client. 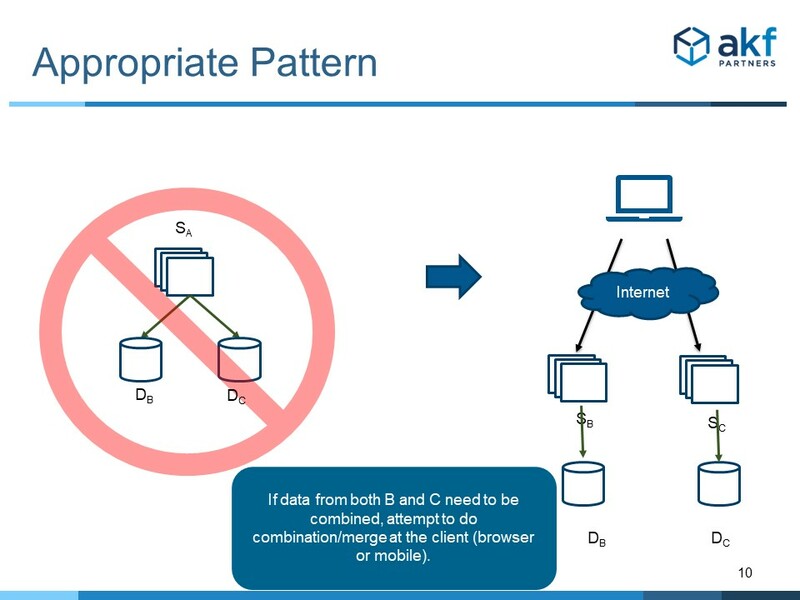 The browser or mobile client can request each dataset in parallel and merge if successful. This works when computational complexity of the merge is relatively low. When client-side merging is not possible, we turn to the X Axis of the Scale Cube for resolution. 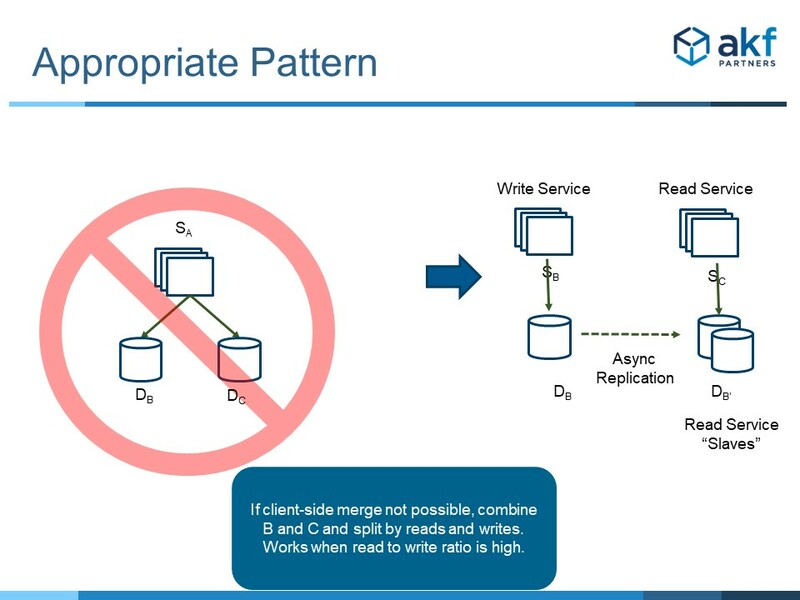 Merge the data sets within the data store/persistence engine and rely on a split of reads and writes. All writes occur to a single merged data store, and read replicas are employed for all reads. The write and read services should be split accordingly and our infrastructure needs to correctly route writes to the write service and reads to the read service. This is a valuable approach when we have high read to right ratios – fortunately the case in many solutions. Note that we prefer to use asynchronous replication and allow the “slave” solutions to be “eventually consistent” - but ideally still within a tolerable time frame of milliseconds or a handful of seconds. What about the case where a solution may have a high write to read ratio (exceptionally high writes), and data needs to be aggregated? This rather unique case may be best solved by the Z axis of the AKF Scale Cube, splitting transactions along customer boundaries but ensuring the unification of the database for each customer (or region, or whatever “shard key” makes sense). 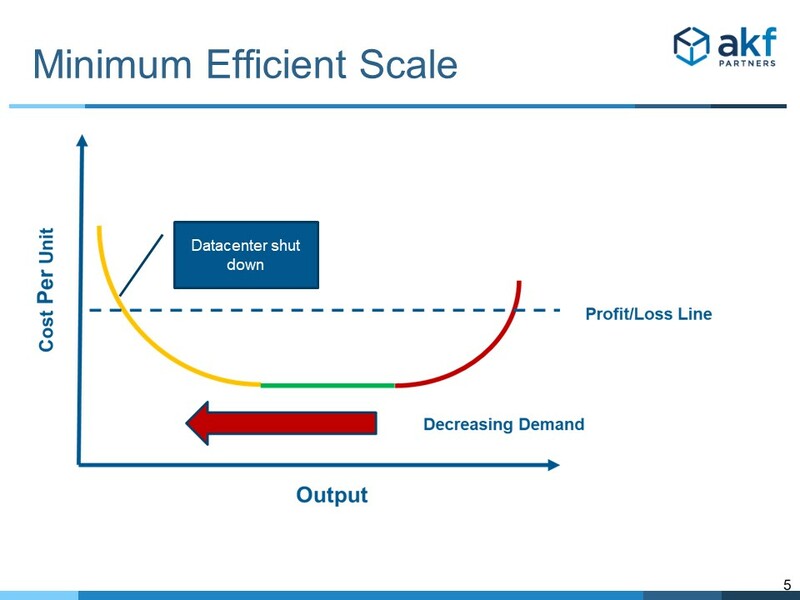 As with all Z axis shards, this not only allows faster response times (smaller data segments) but engenders high scalability and availability while also allowing us to put data “closer to the customer” using the service. AKF Partners helps companies create highly available, highly scalable, easily maintained and easily developed microservice architectures. Give us a call - we can help! This article is the second in a multi-part series on microservices (micro-services) anti-patterns. 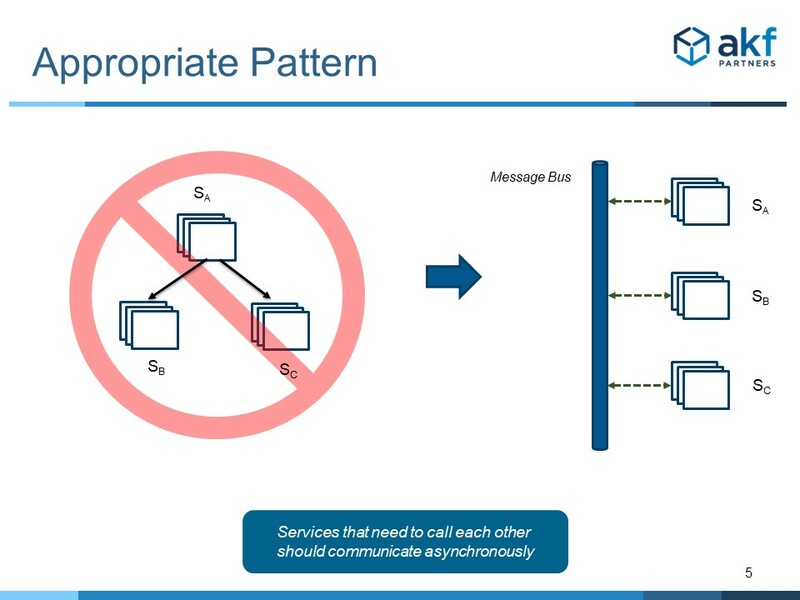 The introduction of the first article, Service Calls In Series, covers the benefits of splitting services, many of the mistakes or failure points teams create in services splits and the first anti pattern. Fan Out, the topic of this microservice anti-pattern, exists when one service either serves as a proxy to two or more downstream services, or serves as an integration of two subsequent service calls. 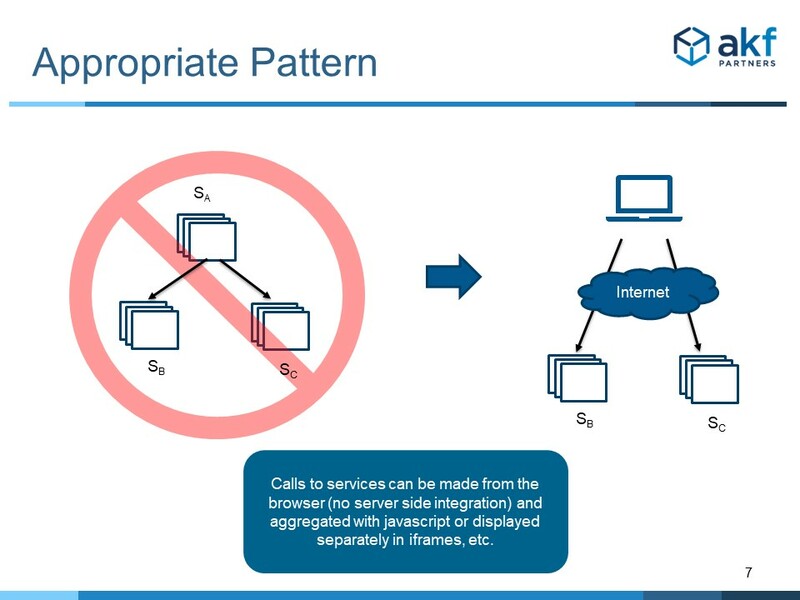 Any of the services (the proxy/integration service “A”, or constituent services “B” and “C”) can cause a failure of all services. When service A fails, service B and C clearly can’t be called. If either service B or C fails or becomes slow, they can affect service A by tying up communication ports. Ultimately, under high call volume, service A may become unavailable due to problems with either B or C.
Further, the response of the services may be tied to the slowest responding service. If A needs both B and C to respond to a request (as in the case of integration), then the speed at which A responds is tied to the slowest response times of B and C. If service A merely proxies B or C, then extreme slowness in either may cause slowness in A and therefore slowness in all calls. Because overall availability is negatively impacted, we consider Service Fan Out to be a microservice anti-pattern. 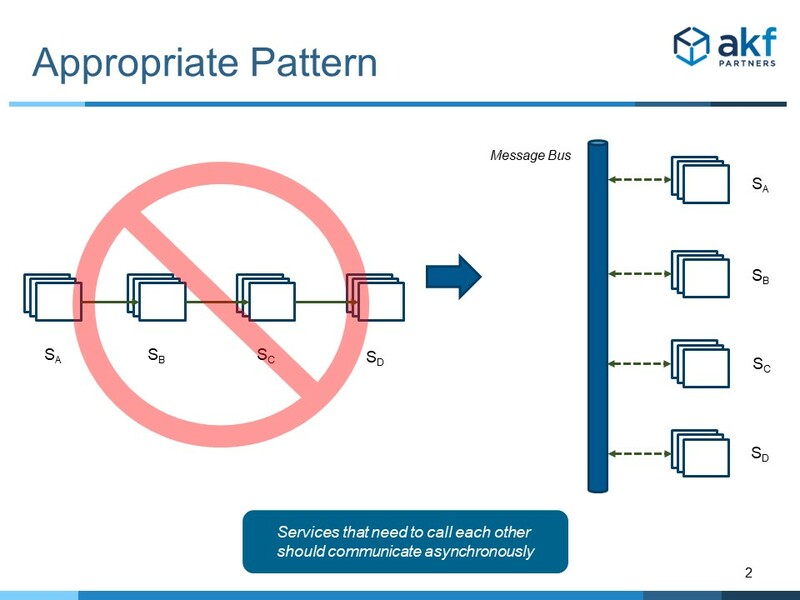 One approach to resolve the above anti-pattern is to employ true asynchronous messaging between services. For this to be successful, the requesting service A must be capable of responding to a request without receiving any constituent service responses. Unfortunately, this solution only works in some cases such as the case where service B is returning data that adds value to service A. One such example is a recommendation engine that returns other items a user might like to purchase. The absence of service B responding to A’s request for recommendations is unfortunate but doesn’t eliminate the value of A’s response completely. As was the case with the Calls In Series Anti-Pattern, we may also be able to solve this anti-pattern with ”Libraries for Depth” pattern. Of course, each of the libraries also represents a constituent part that may fail for any call – but the number of moving parts for each constituent part decreases significantly relative to a separately deployed service call. For instance, no network interface is required, no additional host and virtual VM is employed during the call, etc. Additionally, call latency goes down without network interfaces. The most common complaint about this pattern is that development teams cannot release independently. But, as we all know, this problem has been fixed for quite some time with Unix, Linux and Windows dynamically loadable libraries (dlls, dls) and the like. AKF Partners has helped to architect some of the most scalable, highly available, fault-tolerant and fastest response time solutions on the internet. Give us a call - we can help. This article is the first in a multi-part series on microservices (micro-services) anti-patterns. The above should be considered only a partial list. See our articles on the AKF Scale Cube, and when you should split services for more information. In order to achieve any of the above benefits, you must be very careful to avoid common mistakes. Most of the failures that we see in microservices stem from a lack of understanding of the multiplicative effect of failure or “MEF”. Put simply, MEF indicates that the availability of any solution in series is a product of the availability of all components in that series. Service A has an availability calculated by the product of its constituent parts. Those parts include all of the software and infrastructure necessary to run service A. The server availability, the application availability, associated library and runtime environment availabilities, operating system availability, virtualization software availability, etc. Let’s say those availabilities somehow achieve a “service” availability of “Five 9s” or 99.999 as measured by duration of outages. To achieve 99.999 we are assuming that we have made the service “highly available” through multiple copies, each being “stateless” in its operation. Service B has a similar availability calculated in a similar fashion. Again, let’s assume 99.999. If, for a request from any customer to Service A, Service B must also be called, the two availabilities are multiplied together. The new calculated availability is by definition lower than any service in isolation. We move our availability from 99.999 to 99.998. 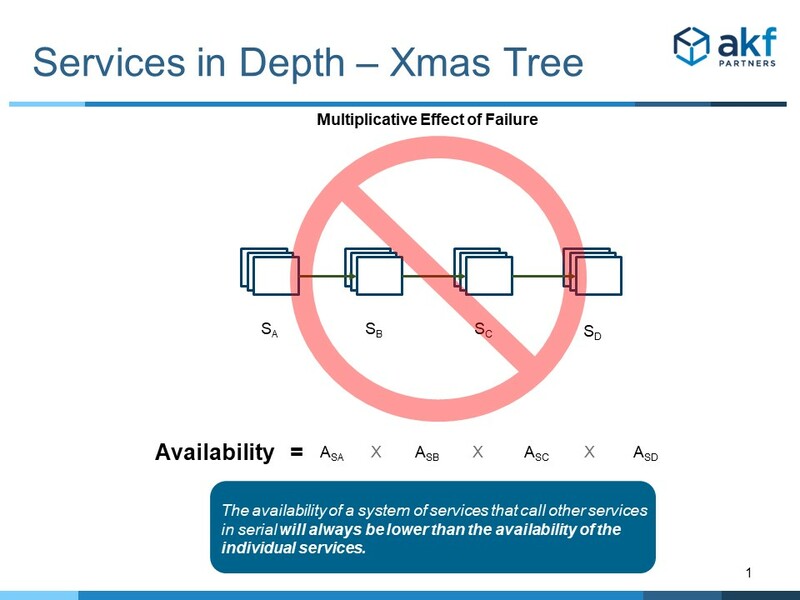 When calls in series between services become long, availability starts to decline swiftly and by definition is always much smaller than the lowest availability of any service or the constituent part of any service (e.g. hardware, OS, app, etc). This creates our first anti-pattern. Just as bulbs in the old serially wired Christmas Tree lights would cause an entire string to fail, so does any service failure cause the entire call stream to fail. Hence multiple names for this first anti-pattern: Christmas Tree Light Anti-Pattern, Microservice Calls in Series Anti-Pattern, etc. The multiplicative effect of failure sometimes is worse with slowly responding solutions than with failures themselves. We can easily respond from failures through “heartbeat” transactions. But slow responses are more difficult. While we can use circuit breaker constructs such as hystrix switches – these assume that we know the threshold under which our call string will break. Unfortunately, under intense flash load situations (unforeseen high demand), small spikes in demand can cause failure scenarios. One pattern to resolve the above issue is to employ true asynchronous messaging between services. To make this effective, the requesting service must not care whether it receives a response. This service must be capable of responding to a request without receiving any downstream response. Unfortunately, this solution only works in some cases such as the case where service B is returning data that adds value to service A. One such example is a recommendation engine that returns other items a user might like to purchase. The absence of service B responding to A’s request for recommendations is unfortunate, but doesn’t eliminate the value of A’s response completely. While the above pattern can resolve some use-cases, it doesn’t resolve most of them. Most often downstream services are doing more than “modifying” value for the calling service: they are providing specific necessary functions. These functions may be mail services, print services, data access services, or even component parts of a value stream such as “add to cart” and “compute tax” during checkout. In these cases, we believe in employing the Libraries for Depth pattern. Of course, each of the libraries also represents a constituent part that may fail for any call – but the number of moving parts for each constituent part decreases significantly relative to another service call. For instance, no network interface is required, no additional host and virtual VM is employed during the call, etc. Additionally, call latency goes down without network interfaces. Scalability doesn’t somehow magically appear when you trust a cloud provider to host your systems. While Amazon, Google, Microsoft, and others likely will be able to provide a lot more redundancy in power, network, cooling, and expertise in infrastructure than hosting yourself – how you are set up using their tools is still very much up to your budget and which tools you choose to utilize. Additionally, how well your code is written to take advantage of additional resources will affect scalability and availability. 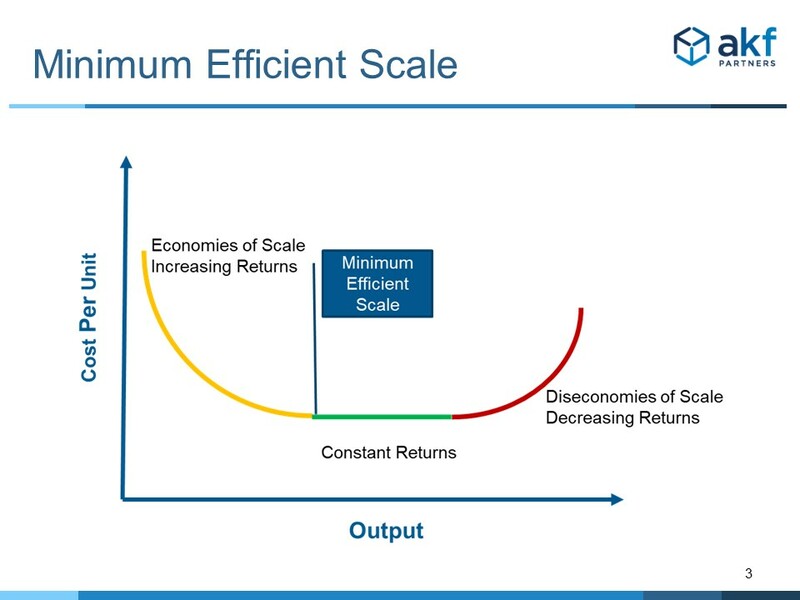 This blog is a summary recap of the AKF Scale Cube (much of the content contains direct quotes from the original text), an explanation of each axis, and how you can be better prepared to scale within the cloud. Using ServiceNow as an early example of designing, implementing, and deploying for scale early in its life, we outlined how building in fault tolerance helped scale in early development – and a decade + later the once little known company has been able to keep up with fast growth with over $2B in revenue and some forecasts expecting that number to climb to $15B in the coming years. So how did they do it? ServiceNow contracted with AKF Partners over a number of engagements to help them think through their future architectural needs and ultimately hired one of the founding partners to augment their already-talented engineering staff. The original scale cube has stood the test of time and we have used the same three-dimensional model with security, people development, and many other crucial organizational areas needing to rapidly expand with high availability. 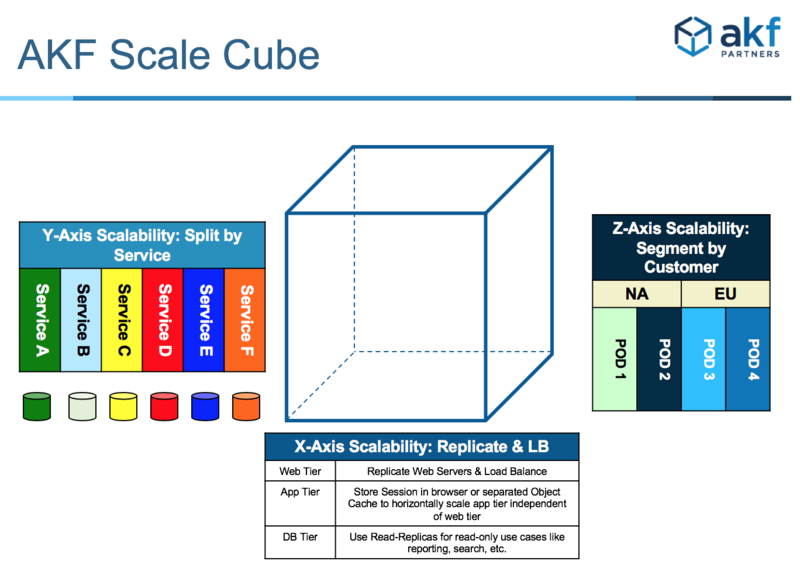 At the heart of the AKF Scale Cube are three simple axes, each with an associated rule for scalability. 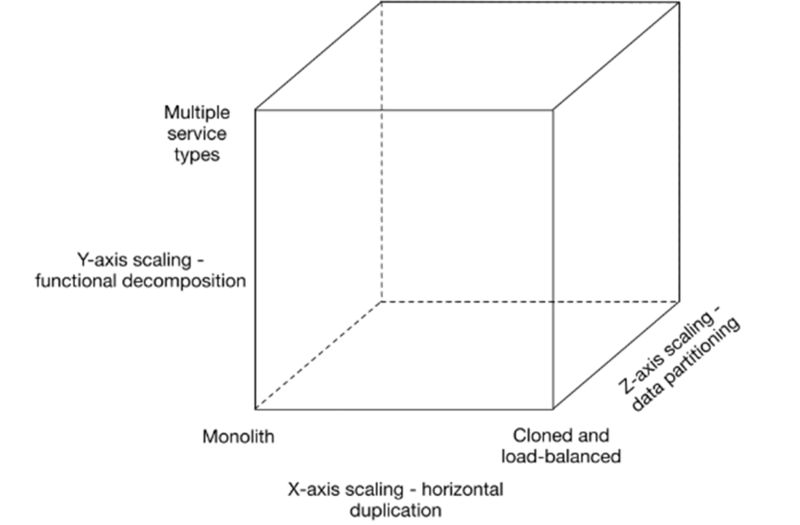 The cube is a great way to represent the path from minimal scale (lower left front of the cube) to near-infinite scalability (upper right back corner of the cube). Sometimes, it’s easier to see these three axes without the confined space of the cube. The X Axis allows transaction volumes to increase easily and quickly. If data is starting to become unwieldy on databases, distributed architecture allows for reducing the degree of multi-tenancy (Z Axis) or split discrete services off (Y Axis) onto similarly sized hardware. 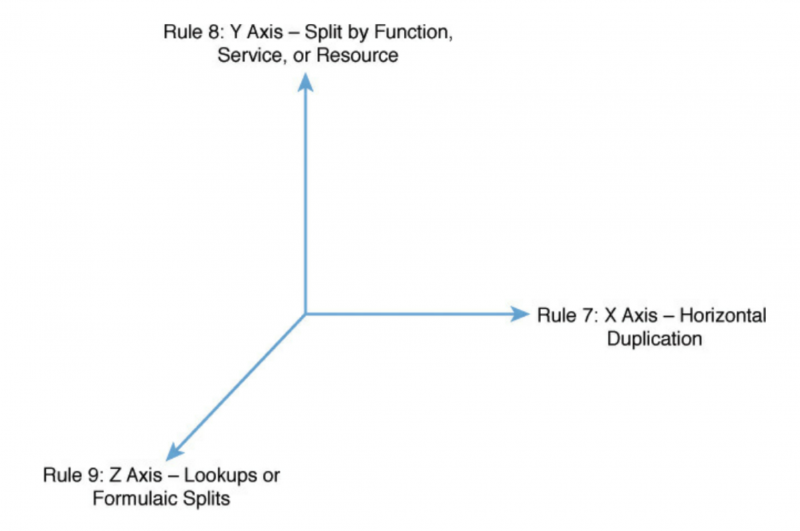 A simple example of X Axis splits is cloning web servers and application servers and placing them behind a load balancer. This cloning allows the distribution of transactions across systems evenly for horizontal scale. Cloning of application or web services tends to be relatively easy to perform and allows us to scale the number of transactions processed. Unfortunately, it doesn’t really help us when trying to scale the data we must manipulate to perform these transactions as memory caching of data unique to several customers or unique to disparate functions might create a bottleneck that keeps us from scaling these services without significant impact on customer response time. To solve these memory constraints we’ll look to the Y and Z Axes of our scale cube. Looking at a relatively simple e-commerce site, Y Axis splits resources by the verbs of signup, login, search, browse, view, add to cart, and purchase/buy. The data necessary to perform any one of these transactions can vary significantly from the data necessary for the other transactions. In terms of security, using the Y Axis to segregate and encrypt Personally Identifiable Information (PII) to a separate database provides the required security without requiring all other services to go through a firewall and encryption. This decreases cost, puts less load on your firewall, and ensures greater availability and uptime. Y Axis splits also apply to a noun approach. Within a simple e-commerce site data can be split by product catalog, product inventory, user account information, marketing information, and so on. While Y axis splits are most useful in scaling data sets, they are also useful in scaling code bases. Because services or resources are now split, the actions performed and the code necessary to perform them are split up as well. 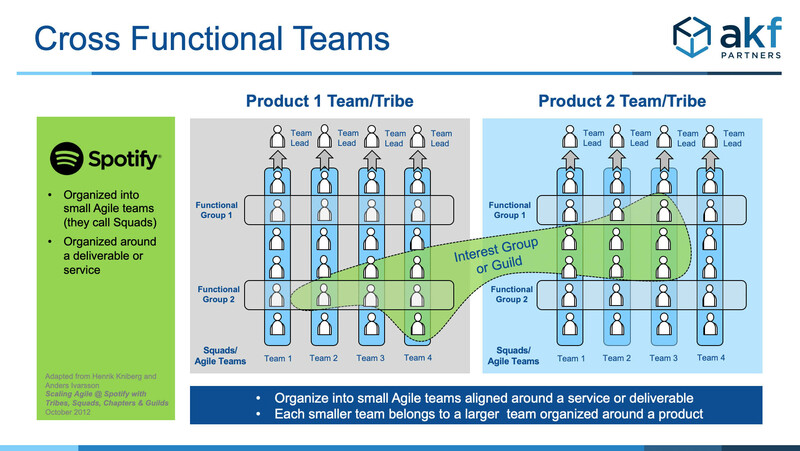 This works very well for small Agile development teams as each team can become experts in subsets of larger systems and don’t need to worry about or become experts on every other part of the system. 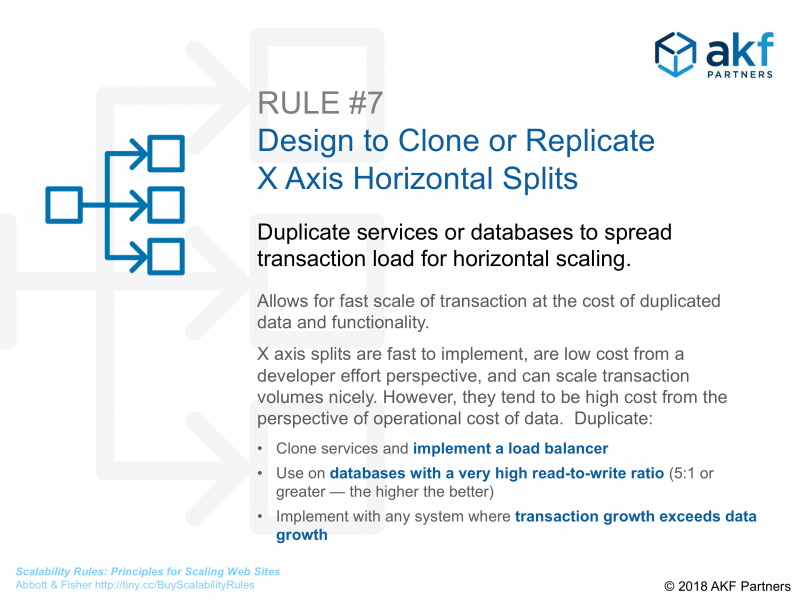 Z Axis splits are effective at helping you to scale customer bases but can also be applied to other very large data sets that can’t be pulled apart using the Y Axis methodology. 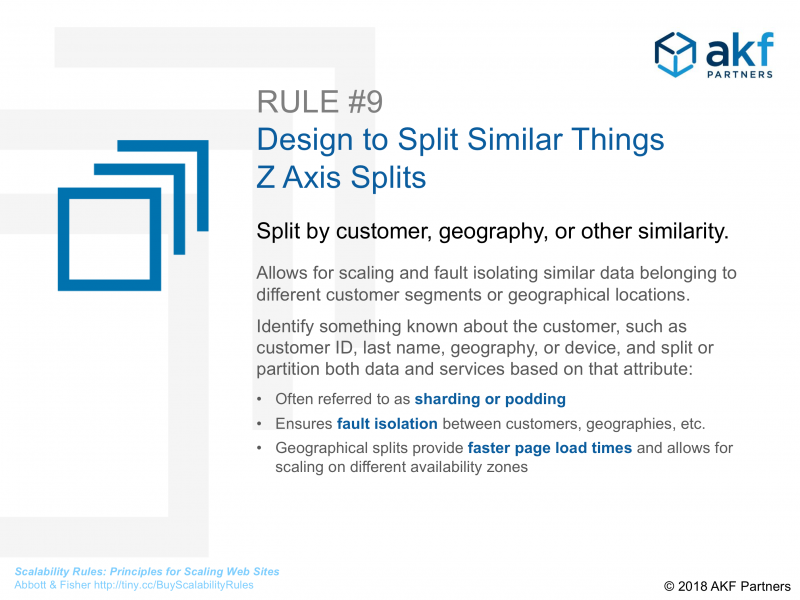 Z Axis separation is useful for containerizing customers or a geographical replication of data. If Y Axis splits are the layers in a cake with each verb or noun having their own separate layer, a Z Axis split is having a separate cake (sharding) for each customer, geography, or other subset of data. This means that each larger customer or geography could have its own dedicated Web, application, and database servers. Given that we also want to leverage the cost efficiencies enabled by multitenancy, we also want to have multiple small customers exist within a single shard which can later be isolated when one of the customers grows to a predetermined size that makes financial or contractual sense. For hyper-growth companies the speed with which any request can be answered to is at least partially determined by the cache hit ratio of near and distant caches. This speed in turn indicates how many transactions any given system can process, which in turn determines how many systems are needed to process a number of requests. 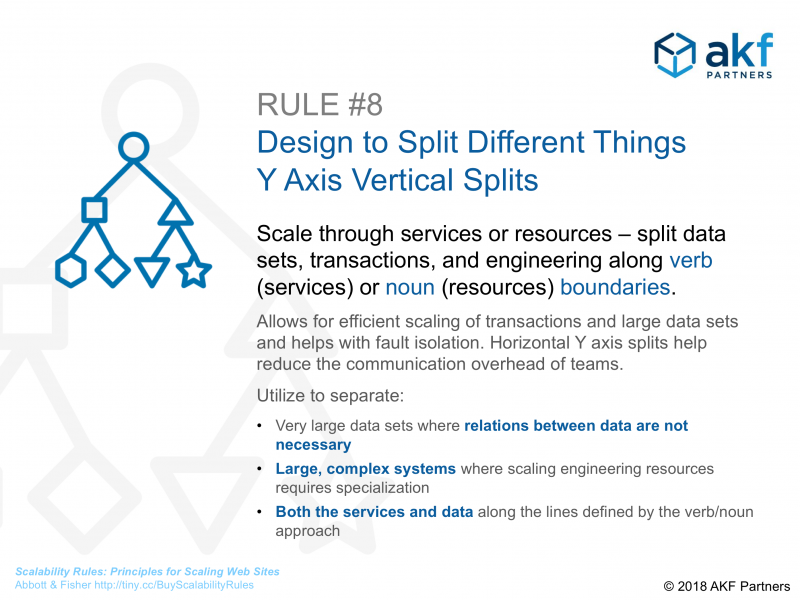 Splitting up data by geography or customer allows each segment higher availability, scalability, and reliability as problems within one subset will not affect other subsets. In continuous deployment environments, it also allows fragmented code rollout and testing of new features a little at a time instead of an all-or-nothing approach. This is a quick and dirty breakdown of Scalability Rules that have been applied at thousands of successful companies and provided near infinite scalability when properly implemented. We love helping companies of all shapes and sizes (we have experience with development teams of 2-3 engineers to thousands). Contact us to explore how we can help guide your company to scale your organization, processes, and technology for hyper growth!